President Museveni late last night indicated that the al Shabaab were behind the Sunday terror attacks in Kampala and declared all-out war on the Somali militants.“We are going to go on the offensive and go for all who did this in all areas, starting here,” he said. “We were just in Mogadishu to guard the airport and the presidential palace - that was all. Now, they have mobilised us to look for them. We were just doing our small mandate … now we are taking interest. It was a very big mistake on their side,” the President told journalists at a news conference at one of his country homes in Ntungamo, western Uganda between 11pm and midnight. At least 74 people died and more than 50 were injured in the attacks at the Ethiopian Village Restaurant and Kyadondo Rugby Grounds in Kampala. 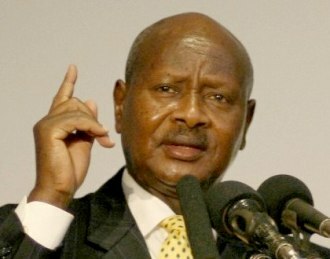 Mr Museveni, speaking for the first time since investigations into the terror attacks got underway, also indicated there was a possible failure of intelligence which allowed the attacks.“The main problem was our laxity and liberal atmosphere … we never interfere with functions of private people. We never monitor very closely the foreigners who come here … We have been having a free atmosphere,” he said. The al Shabaab, who have since claimed responsibility for the attacks, have very recently threatened to attack Uganda and Burundi for sending peacekeeping troops to their country to protect the government of President Sheikh Ahmed Sherif. The Islamist group has strong ties with Osama Bin Laden’s al Qaeda military network which masterminded the 1998 bombings of US embassies in Kenya and Tanzania, killing more than 200 people, and the September 11, 2001 attack on the US which claimed more than 1,000 people. Mr Museveni said yesterday that boosting troop numbers in Somalia is key to dealing a decisive blow against the Islamist group.“I am optimistic that these numbers will be raised now especially now because these people have provoked the world more than before. And I can assure you they have invited a lot of problems for themselves,” he said.